Course Description: This course broadens students' understanding of mathematics as it relates to managing data. Students will apply methods for organizing and analysing large amounts of information; apply counting techniques, probability, and statistics in modelling and solving problems; and carry out a data management investigation that integrates the expectations of the course and encourages perseverance and independence. Students planning to pursue university programs in business, the social sciences, or the humanities will find this course of particular interest. In this unit, students will be using spreadsheets and graphing software to perform complex calculations and link, search, sort and graph data. Among other assignments students are introduced in this unit to the Statistics Canada website where they will learn methods of data retrieval and the creation of graphs using CANSIM. In this unit students will demonstrate an understanding of the role of data in statistical studies and the variability inherent in data, and distinguish different types of data; describe the characteristics of a good sample, some sampling techniques, and principles of primary data collection, and collect and organize data to solve a problem; demonstrate an understanding of the applications of data management used by the media and the advertising industry and in various occupations. This unit will focus on the analysis and presentation of one-variable data. Students will process raw data and develop the skills to summarize it in terms of central tendency, spread and distribution. 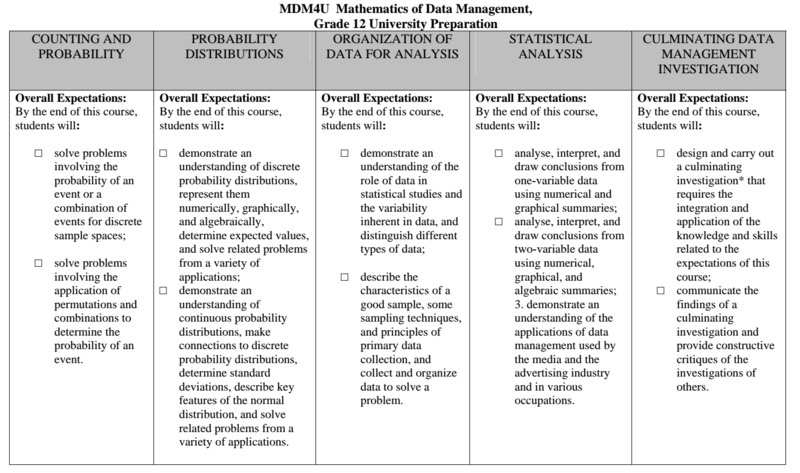 Students will analyze, interpret, and draw conclusions from one-variable data using numerical and graphical summaries and explore methods of describing a single piece of data in the context of a wider data set. This unit will examine some of the basic topics in two-variable statistics. In this unit students will analyse, interpret, and draw conclusions from two-variable data using numerical, graphical, and algebraic summaries. In this unit, . students will investigate the concepts of combinations and permutations. They will consider situations in which each should be used, and develop the skills to be able to determine which is most appropriate. In this unit students will solve problems involving the probability of an event or a combination of events for discrete sample spaces; solve problems involving the application of permutations and combinations to determine the probability of an event; demonstrate an understanding of discrete probability distributions, represent them numerically, graphically, and algebraically, determine expected values, and solve related problems from a variety of applications.Students will solve problems involving the probability of an event or a combination of events for discrete sample spaces; solve problems involving the application of permutations and combinations to determine the probability of an event; demonstrate an understanding of discrete probability distributions, represent them numerically, graphically, and algebraically, determine expected values, and solve related problems from a variety of applications.